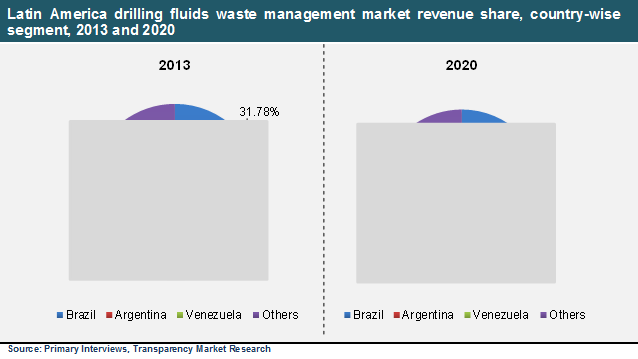 The Latin America drilling fluids waste management market is exhibiting a CAGR of 12.60% between 2014 and 2020. This market is expected to reach US$945.3 mn by the end of 2020 and was recorded at US$413.4 mn in 2013, according to a research report released by Transparency Market Research. The report, titled “Latin America Drilling Fluids Waste Management Market - Industry Analysis, Size, Share, Growth, Trends and Forecast, 2014 - 2020”, reveals the key statistics and factors influencing the Latin America drilling fluids waste management market in order to devise a logical forecast. According to the report, the Latin America drilling fluids waste management market is primarily driven by the increasing production and exploratory activities in the region. The large increase in drilling activities has created a greater need for the waste management strategies to protect the regional landscape and its flora and fauna.The Latin America drilling fluids waste management market benefits greatly from the strict government mandates that require all drilling activities to be retrofitted with waste management systems. However, the Latin America drilling fluids waste management market does suffer from setbacks, the biggest of which is the operational challenges faced by drilling companies in adopting drilling fluids waste management services.The report’s geographical segmentation of the Latin America drilling fluids waste management market reveals Brazil to be the market leader for 2013 owing to the country’s large-scale drilling activities on offshore reserves. Brazilian oil companies are also receiving greater investments, which allow them to command a significant share in the Latin America drilling fluids waste management market. The report claims that Argentina will close up the gap between itself and Brazil in the Latin America drilling fluids waste management market in the near future. The region’s market is expected to benefit from multiple impending government schemes that are aimed at production of shale gas and the exploration of additional shale gas reserves.The report also provides a service-wise segmentation of the Latin America drilling fluids waste management market, which reveals the dominant segment to be treatment and disposal. The treatment and disposal segment held more than 35% of the Latin America drilling fluids waste management market in 2013. This leading market share has been attributed to strengthening governmental control over the disposal of waste from drilling activities. In terms of applications, the Latin America drilling fluids waste management market was dominated by offshore drilling, which held over 55% of the market in 2013.The key players in the Latin America drilling fluids waste management market are Baker Hughes Incorporated, Imdex Limited, Weatherford International Ltd., National Oilwell Varco, Halliburton Company, and Schlumberger Limited. The report explains how brand image plays an important part in the global drilling fluids waste management market, as services are availed on a contractual basis.